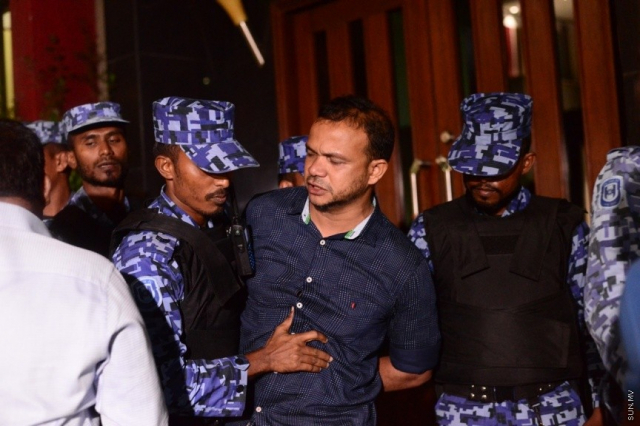 Kendhoo MP Ali Hussain – arrested by police during the opposition’s demonstrations in Male’ City on Friday and Saturday – is under investigation for three charges. Ali Hussain is under investigation for obstruction of justice, attempting to create unrest in Male’ City, and using profanity when communicating with police officers. Speaking to press after he was questioned by the police last Sunday night, Ali Hussain said he was arrested unconstitutionally, and that he was denied his constitutional rights during his arrest. Meanwhile, an obstruction charge has already filed against him with the Criminal Court. Former Deputy Minister at Ministry of Gender and Family – Aminath Nadira and South Galolhu MP Ahmed Mahloof were also summoned by the police for questioning last Sunday night. Nadira is under investigation for two charges, while Mahloof is under investigation for four charges.